Over 1,600 infantrymen from across Shingen's domain gather before Kofu station and march through the streets of central Kofu, just as Shingen's army did before heading off to battle. 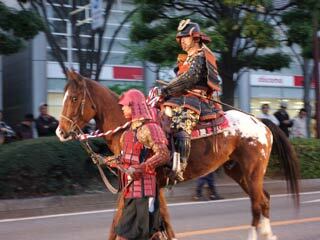 This is by far the most popular samurai festival in Japan. The participants spend the entire year practising for their roles in this event that imitate the battle of Kawanakajima.The armour worn and the equipment carried is spectacular and accurate. This event would probably be the most recommended event to witness, especially for anyone interested in Japanese samurai culture and Takeda Shingen. The festival is held by Takeda Shrine. Takeda Shingen (1521-1573) was by far the exemplar of a successful Sengoku period (1477-1600) Daimyo. He ruled his provinces well and many years later Tokugawa Ieyasu implemented many of the same governing methods as Takeda Shingen when he founded the Tokugawa government. Shingen was served loyally in war by his famous "twenty-four generals." His greatest rival was Uesugi Kenshin and they fought on five occasions at Kawanakajima with the fourth battle there in 1561 being their greatest contest. He proved his ability in war at the battle of Mikata ga hara in 1572 against Tokugawa Ieyasu which nearly saw the end of the Tokugawa. According to the Koyo Gunkan, the great military records of the Takeda family, the Takeda army consisted of 33,736 men in 1573.